Born and raised in Berlin Weißensee, Backflasch founder Sylvie Assig is a genuine Berlin original. She's had a sweet tooth ever since she can remember and has had a passion for baking ever since. With a major in Applied Cultural Studies, she was brought closer to the broad range of language and communication. As a freelancer for the Goethe Institute, she is now trying to bring the beauty of the German language and culture closer to others. A job that sometimes gives her rather unconventional ideas. She came across the thought of visualising historic context, for example, in form of layered ingredients which would ultimately result in a cookie. Starting off as a quirky gift idea for friends, it soon turned into an actually marketed product. 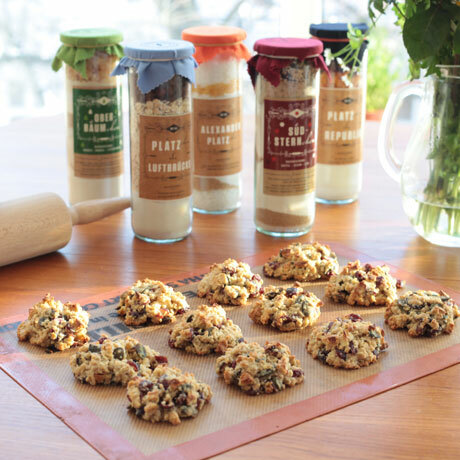 Each bottled Backflasch cookie mix tells a different tale of Berlin history and is dedicated to a historic place and its meaning. For instance, you have the 'Nollendorf-Plätzchen', referencing the colourfoul vigour of this classic Berlin quarter with sugar coated chocolate dragées and pure cocoa, or the 'Alexander-Plätzchen', fusing socialist Cuban coconut flakes with Spanish oranges. The mixtures are absolutely compatible with the more sluggish type of gourmet as nearly all necessary ingredients are well-assembled in those little glass jars. You won't have to add anything but an egg, some butter or water to it. And – as it is almost mandatory these days – all ingredients provided are of highest possible quality. I would love to just go on and tell you about all the stories hidden in those cookie jars as they're thought through and put together with so much love for details, but it's just incomparable fun to discover them for yourself.